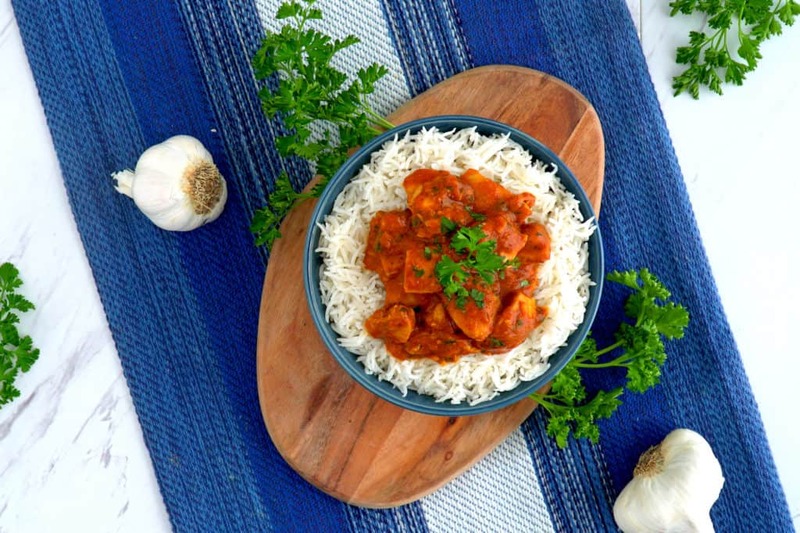 How to Make Indian Butter Chicken the EASY Way: Healthy Instant Pot Butter Chicken AND Rice Cooked Together! 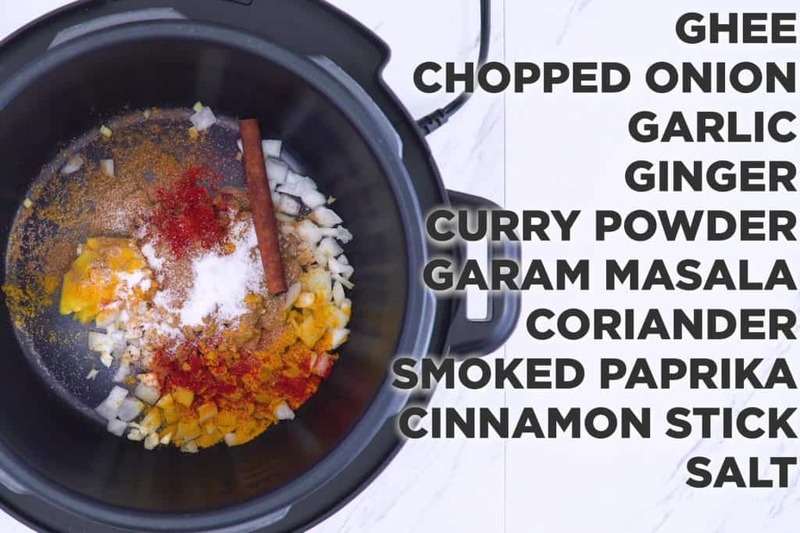 Whether you’re meal prepping for the week or cooking dinner for the family on a weeknight, this instant pot butter chicken and rice recipe is a life-changer. 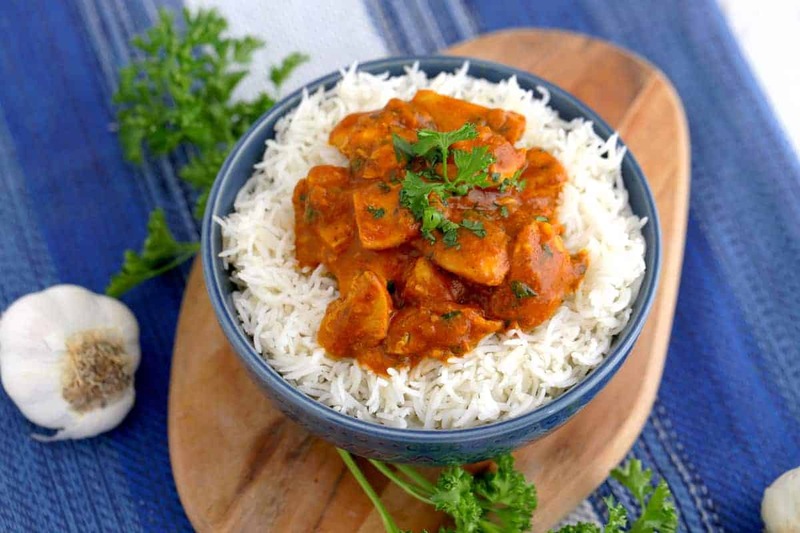 You can have deliciously healthy butter chicken AND perfectly-cooked rice ready to go, at the same time—in just 40 minutes! I’ve actually swapped out butter for ghee and used coconut milk instead of cream, making this butter chicken recipe Whole30 compliant and Paleo friendly! So, I guess it’s technically a ghee chicken recipe…? But it seriously tastes just as amazing and indulgent as the traditional recipe. 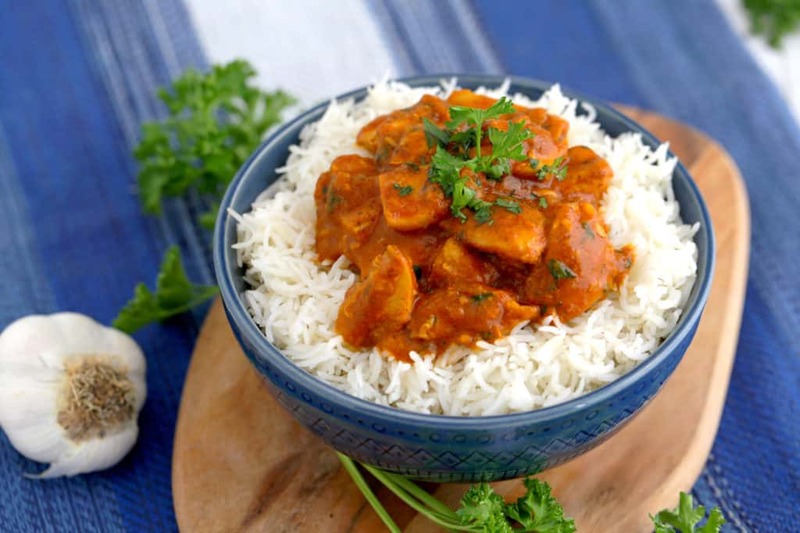 For this instant pot butter chicken and rice meal, you can actually keep your chicken and rice separate, even though they’re in the same pot. 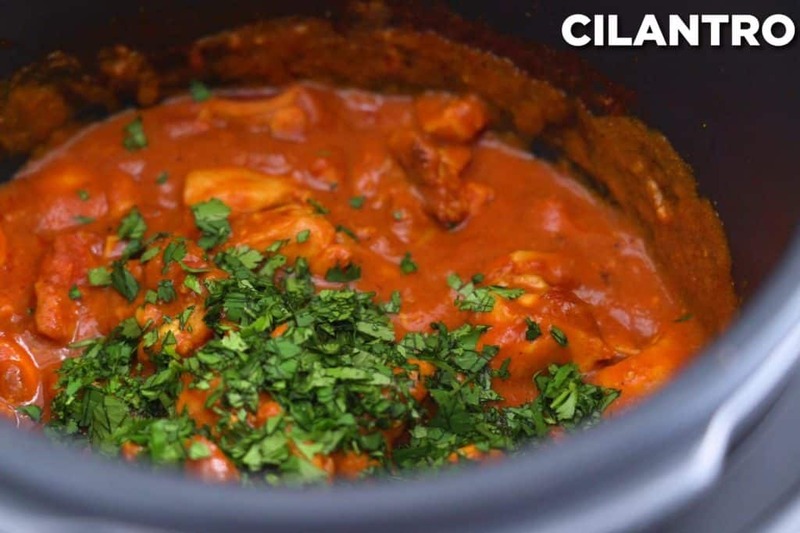 With the help of a nifty instant pot steam rack, your healthy butter chicken cooks in the bottom of your pressure cooker, while your rice cooks in a bowl on top of the steam rack! You can really play with this 2-in-1 hack for tons of other convenient pressure cooker meals, like my instant pot teriyaki chicken and rice recipe. Or, you can make instant pot chicken fajitas with your chicken and veggies cooking in the same pot. 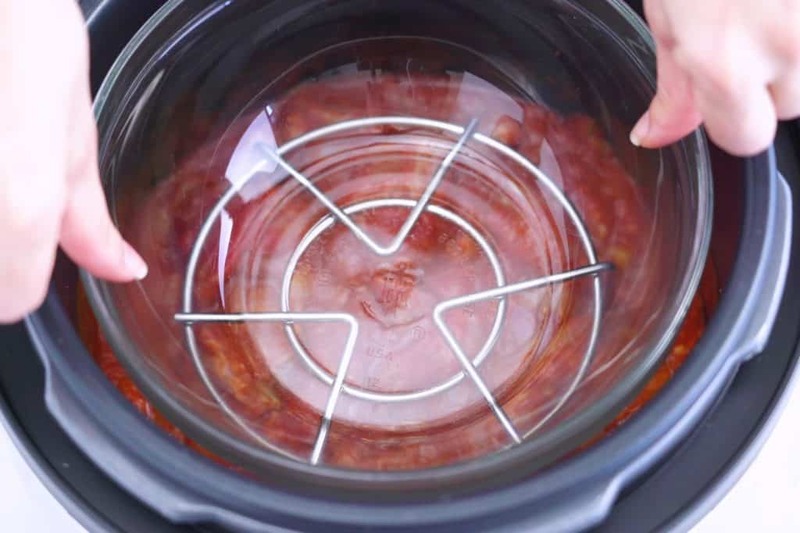 You can even make instant pot spaghetti and meatballs without a steam rack! Seriously, the instant pot is just plain MAGICAL. It lets you sauté, simmer, slow cook, and SO much more, all in the very same machine you’re using to pressure cook. In this recipe, you’ll sauté your onions and spices, pressure-cook your chicken thighs, and even simmer to thicken your sauce—ALL in the instant pot. Plus, I love how pressure-cooking results in juicy, tender, flavorful meat that tastes like it’s been slow-cooked for hours. 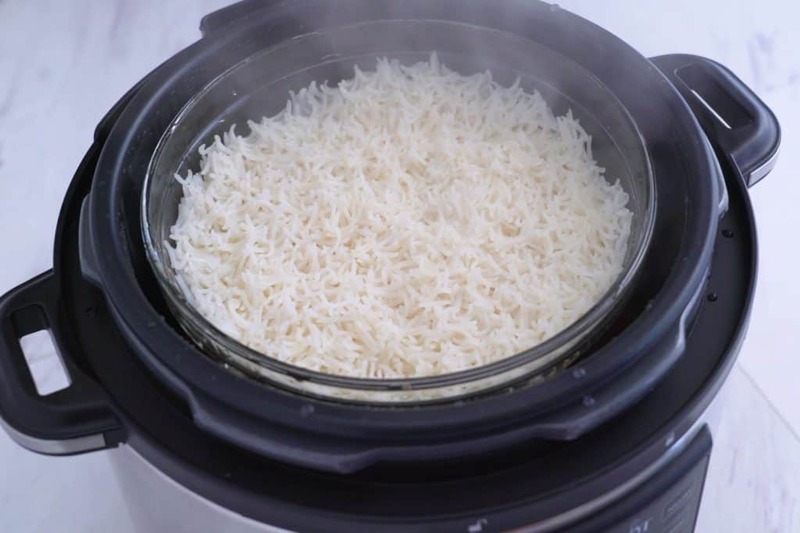 But, it’s actually done after just minutes in the instant pot—and it’ll cook your perfectly fluffy rice at the exact same time! In case you have any doubts: this instant pot butter chicken and rice is a MUST-try. Made with chicken thighs, tomato sauce, coconut milk, and a sumptuous blend of spices, the butter chicken turns out SO rich, flavorful, and indulgent. Yet, it’s still totally clean and nutritious—with no added sugars and no dairy. If you’re looking for a Paleo or Whole30 butter chicken recipe, just leave out the rice and this is a great option! 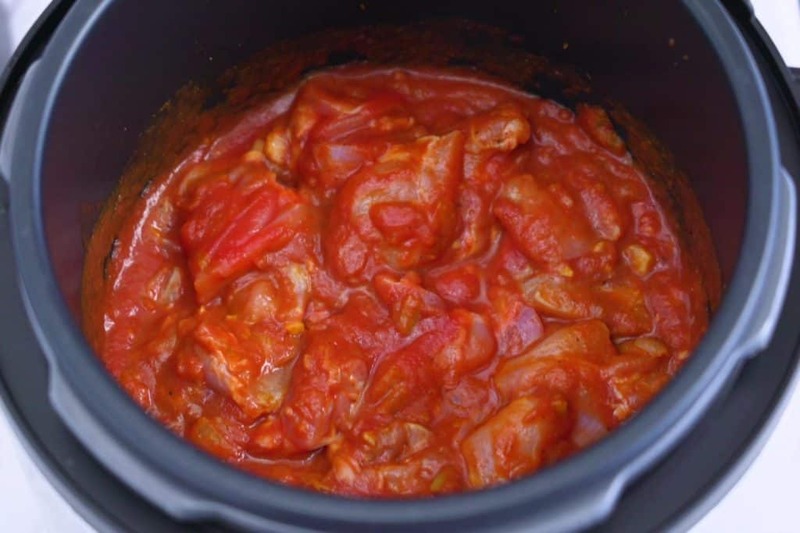 Just like the traditional recipe, the first and most crucial step in making this instant pot butter chicken is to sauté your onions, garlic, and spices in a bit of ghee (or butter). You definitely don’t want to skip this step—it’s so important to get those delicious flavors developing early on, before you add the meat! 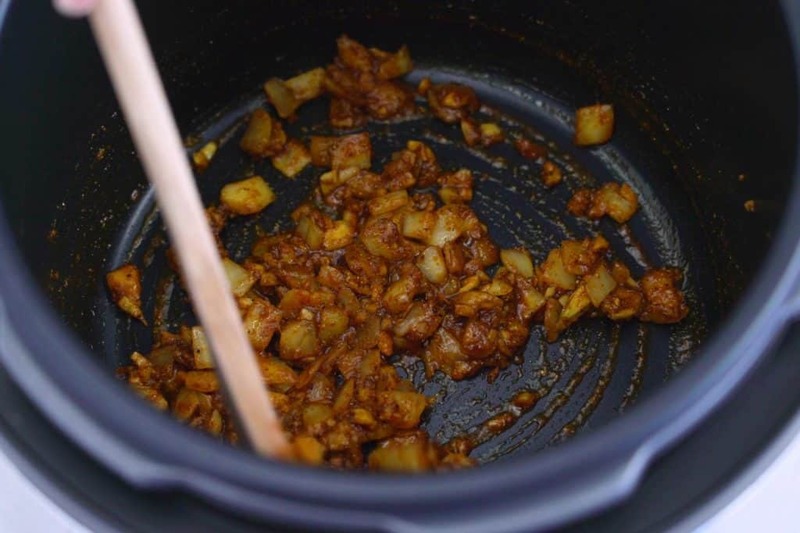 Add ghee, onion, garlic, ginger, and spices to instant pot. Simply add your ghee and all of those flavorings to the pressure cooker, press the ‘SAUTE’ button, and cook for about 5 minutes. Be sure to stir regularly so nothing gets stuck to the pot, and don’t let it burn! Once tender and fragrant, turn off the heat. (If still intact, carefully remove the cinnamon stick using tongs.) Then, add your chopped chicken thighs and tomato sauce, mixing well to coat the chicken in your sauce. Press ‘SAUTE’ button and cook for 5 minutes, stirring regularly. Turn off heat, add chicken thighs and tomato sauce, and mix well to coat. Now, here is where the magic happens…grab that nifty instant pot steam rack! (I got a super affordable set of 3 steam racks with slightly varied heights from Amazon.) 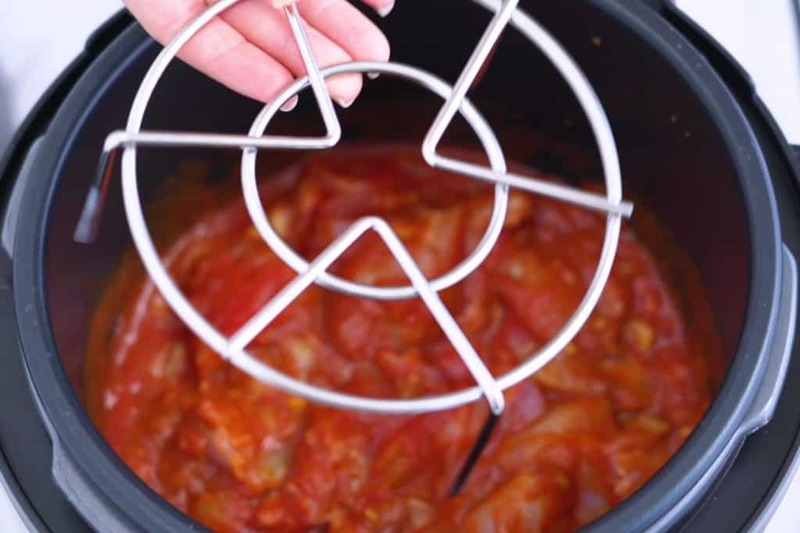 Place your rack into the bottom of the pressure cooker—making sure it’s tall enough so it’s not crushing your butter chicken. Then, you’ll need a heat-proof bowl or container that can fit in your pressure cooker and on top of that rack to cook your rice. Most glass cooking dishes are heat-safe nowadays, and you’ll often see the words ‘heat-proof’ or ‘heat-safe’ on the bottom or elsewhere on a dish. TIP: If you’re unsure whether or not a dish is heat-safe, you can always test it out in the microwave! Simply fill the dish with a cup of water and cook in the microwave on high for one minute. If the water gets hot but the dish is still cool to the touch, the dish is safe. Add a heat-proof bowl on top of steam rack, large enough to hold rice and water. 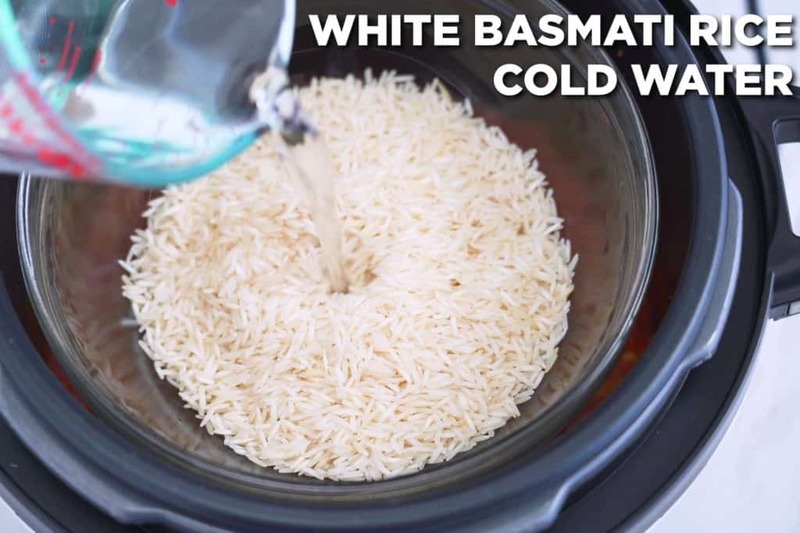 With your bowl in place on top of the steam rack, you can then add your uncooked rice and cold water. I went with long-grain white basmati rice to pair with my instant pot butter chicken, but you could also use this hack with other varieties of rice, too! And, since this rice is being pressure cooked, you actually need less water than the package instructions will recommend—just a 1:1 ratio of rice to cold water. Close up the lid and you’re ready to cook! 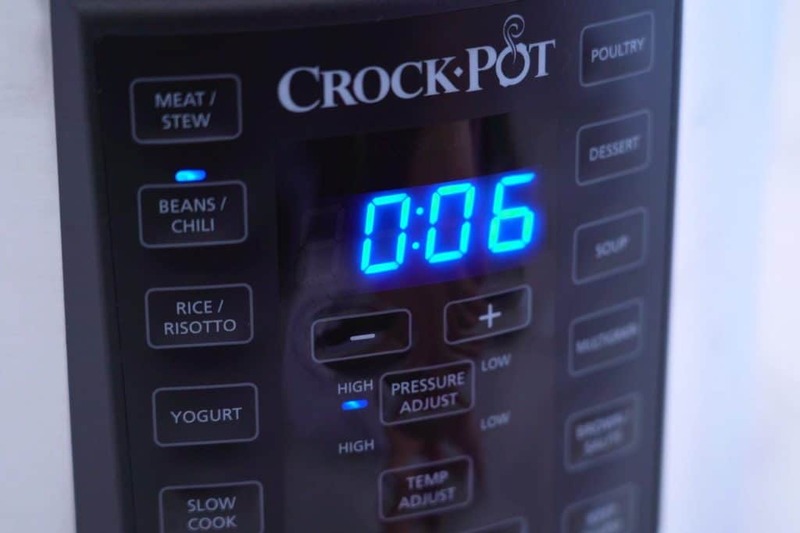 Using your machine’s manual setting, set your instant pot butter chicken and rice to cook on high pressure for 6 minutes. It will have to heat up for a few minutes before the cooking begins, but the short wait is well-worth the ease and convenience of pressure cooking! *Note: My pressure cooker is a Crock-Pot brand pressure cooker—not an official Instant Pot—so the cooking may be a bit different from your cooker! The ‘BEANS/CHILI’ button is the closest setting I’ve got to a manual setting on my cooker. If you don’t know how to use your specific machine’s manual setting, check out the brand’s website or your instruction manual! After those 6 minutes of cooking are done, turn off the heat but don’t open up the lid just yet. First, flip your Quick Pressure Release switch and allow the steam to release for 10 minutes. Cook on manual setting at high pressure for 6 minutes. After cooking, quick release the steam for 10 minutes. Once you’ve given the steam some time to release, CAREFULLY open the lid of your pressure cooker. Even after the steam release, there will still be plenty of steam—so be careful! 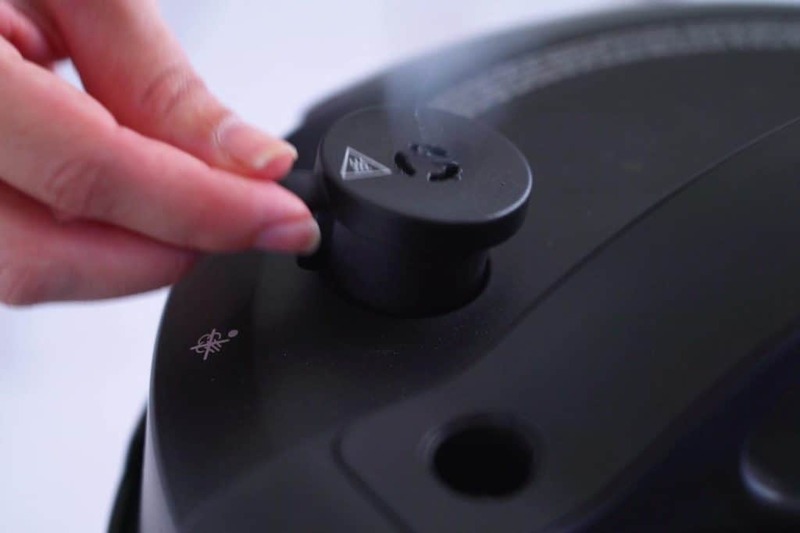 Now you can remove the bowl with your perfectly-cooked rice, followed by the steam rack in the bottom of your cooker. The bowl and steam rack will be hot, so definitely use oven mitts or kitchen towels to protect your hands! Open the lid and use oven mitts to remove bowl of cooked rice. Carefully remove steam rack from the bottom of pressure cooker. 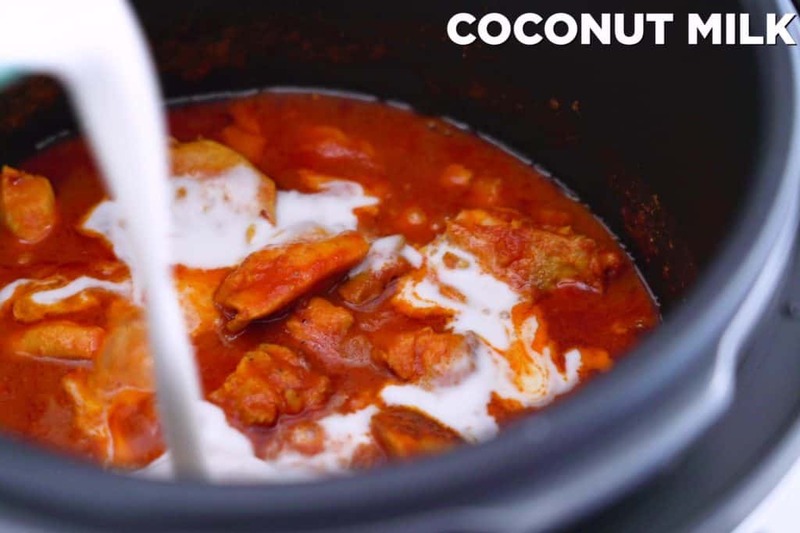 Finally, pour coconut milk into your instant pot butter chicken and stir until it’s well-integrated. This is going to add SO much luscious, creamy, butteriness to your chicken, but without the dairy! Press the ‘SAUTE’ button once again and let your mixture simmer uncovered for another 5-10 minutes, just long enough to thicken up your sauce. Add coconut milk to chicken, stir, and press ‘SAUTE’ to simmer another 5-10 minutes, until thickened. Once it’s perfectly thick and creamy, you can turn off the heat and stir in some fresh cilantro. All that’s left to do is transfer your instant pot butter chicken and rice to storage containers, if you’re meal prepping for the week. Or, serve it up immediately while it’s still warm and enjoy! Turn off heat and stir in fresh cilantro. So unbelievably easy, ultra-convenient, and undeniably delicious! Healthy weeknight dinners don’t have to be so hard, and this instant pot butter chicken and rice is all the proof you’ll need. But, it’s only one of many instant pot 2-in-1 meal possibilities. Feel free to get creative and try this 2-in-1 technique with all sorts of meat-and-rice combo dishes! Why Chicken Thighs? Can I Use Chicken Breast Instead? You’re absolutely welcome to use chicken breast instead of thighs for this instant pot butter chicken recipe. The preparation and cook time would be exactly the same, so it’s an easy swap! Chicken breast tends to be just slightly lower in calories and slightly higher in protein than chicken thighs, which is an important consideration in some people’s lifestyles. But, although many people fear darker meat (like chicken thighs) because it’s higher in calories and fat, it’s actually highly nutritious. It’s still in incredible source of protein, and we actually all need fat in our diets—it’s an essential nutrient for our bodies, and our brains! And the number of calories we eat are less important than the quality of calories we eat. Since chicken thighs are richer in dietary fats, they actually retain more flavor in cooking and stay tender rather than drying out. And, that fat content makes chicken thighs more satiating and filling than lower-fat chicken breasts. Plus, chicken thighs are also richer in some micronutrients like iron, vitamin K, and certain B vitamins like riboflavin! Do I Have to Use Ghee or Can I Substitute with Butter? Of course, you can also stick with traditional butter instead of ghee. After all, it is a BUTTER chicken recipe! Simply substitute the same amount of butter for the amount of ghee in the recipe. Either way, for the most nutritious option, I recommend opting for a higher-quality grass-fed butter or grass-fed ghee (in this recipe, and in general)! Personally, I just love the savory, nutty flavor of ghee in my cooking. And I especially love that it’s dairy free! Since ghee is clarified butter, it contains just the fat and oils from the butter, but all of the milk solids have been removed. A delicious option for anyone doing Whole30, on a Paleo diet, or with lactose intolerance! Add ghee, chopped onions, garlic, ginger and spices to the pressure cooker. Press the ‘SAUTE’ button and cook for about 5 minutes, stirring regularly—don’t let it burn! Add chopped chicken thighs and tomato sauce, mixing to integrate. Place a steam rack into the bottom of the cooker (that’s tall enough so it’s not crushing your chicken), and place a heat-proof bowl or container on top of rack. Fill bowl with uncooked long-grain white rice and cold water. Turn off heat and flip Quick Pressure Release switch to release steam for 10 minutes. Carefully open lid—watch out for steam! 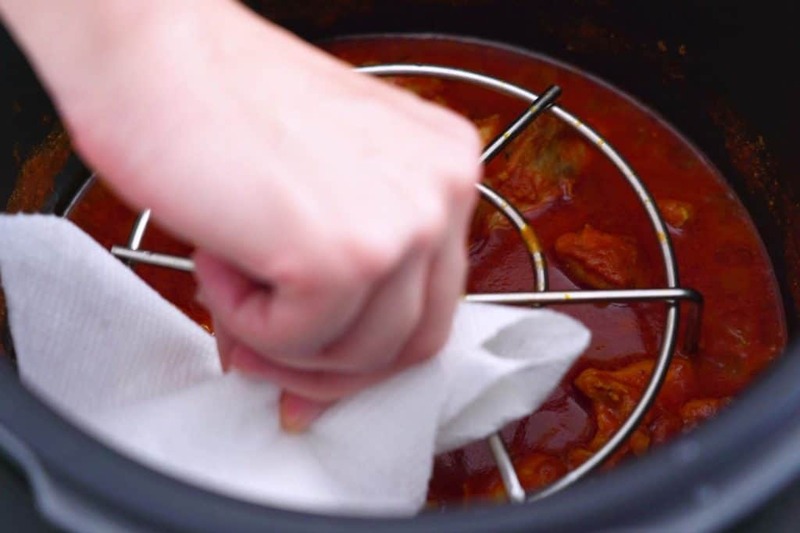 Using oven mitts or towels to protect your hands, remove bowl with cooked rice and steam rack. Stir coconut milk into butter chicken until integrated. Press ‘SAUTE’ button and simmer uncovered for 5-10 more minutes to thicken the sauce. Add chopped cilantro and stir to integrate. 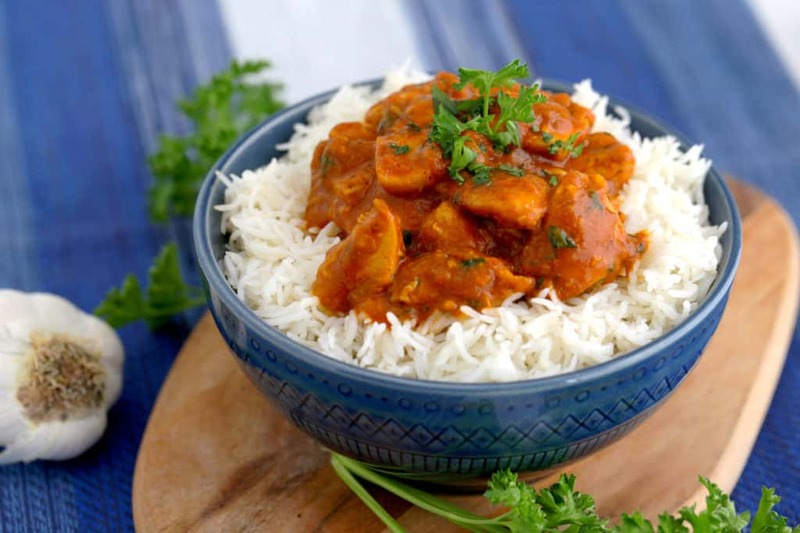 Yields 1½ lbs butter chicken and ~3½-4 cups cooked basmati rice (4 servings total). Provided below per serving of ~6 oz butter chicken.